The story is told by a 500-year-old parrot named Aaron. He has lasted this long because his chosen clavicle, Moishe, is a pirate and in the course of their adventures Aaron ended up drinking from the Fountain of Youth. So now, while he spends his time at the Shalom Home for the Aged in Modern-day Florida he is bored and wants to tell people about his beloved Captain and their adventures on the High Seas during the time of Columbus and his ilk. 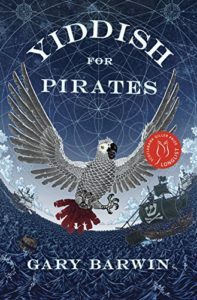 While, yes, this is a fun, funny adventure story about Jewish pirates told in the first person and littered with Yiddish throughout the story, it is also the story of a Jewish boy who decides to become a sailor during the reign of Ferdinand and Isabella, and at the height of the Spanish Inquisition. The pathos of the story never overshadows the humour, but at the same time, it does not shy away from the realities of the situations or the horrors of the Inquisition as well as what was inflicted upon the Native Caribbeans after the Europeans show up and the hardships of life as a pirate. There is a lot of Yiddish in this book. It took a little while to get used to, but once I was in the swing of it, it was fun. It also turns out I know way more Yiddish than I thought I did, which was a fun surprise. The narrative is also a little rambling, but hey, what do you expect from a 500-year-old parrot? I really don’t want to give a lot away about the plot, because I went in blind and looking back I’m really glad I did. I will say, though I found a big exception to my “I don’t like real historical people popping up in novels” thing. It turns out I DO like it very much when the setting is obviously satirical and using the famous person to give context to the satire. Share the post "Listen to the Farkakte Bird, Bubula. He Has a Story to Tell"